Another awesome one written by Vee. I don’t see what’s wrong with smoking peppermint tea… I do it all the time! I imagine that’s a bit nasty. I’ve heard it’s quite nice actually, and with the sleepy-time stuff, you get really tired. it actually tastes pretty good. it just doesn’t get you very high or anything. I really like how you’ve started to do your comics pretty much daily now 🙂 Keep up the good work! Yeah! I’m trying to do 5 comics a week, but I don’t want to make a promise that I can’t keep, so its not really an official quota yet. shouldn’t it be “would you be a dear AND give me a hand with this” ? Ugh, yeah it is. I will have to fix it when I get home. Thanks. Peppermint tea is the best. Gives a cough-syrupy cleanness to the lungs. The pneumonia is pleasantly minty. did you go out and smoke some tea to give us a review? I have peppermint tea in my pantry…. I almost want to try. 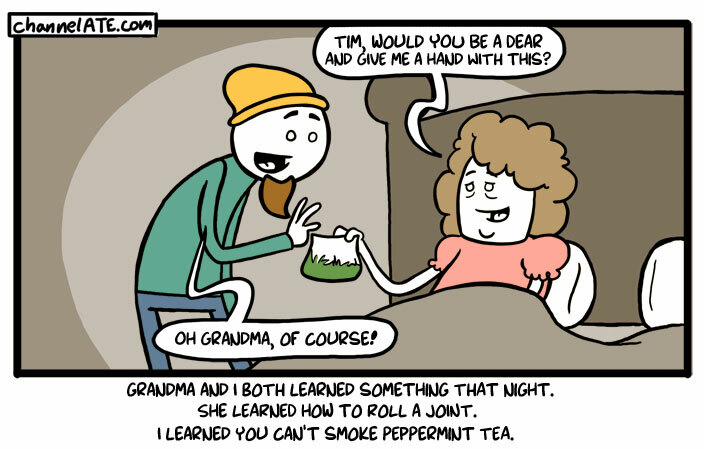 awesome comic, but i know something even better for grandma’s glaucoma..
i don’t get it… is it peppermint tea in the bag? why is she trying to smoke that? you should have waited until today to post this one. ha! time to replace the optical illusion image on my desktop background with this comic. Hi, stumbled from Iceland. So I hope you forgive my grammar. You can to smoke mint tea! It tastes like mint! I thought it was hilarious but then again I’m just a hippie pothead, what do I know. What makes you think Grandma wouldn’t know how to roll a joint? EuwpoE I truly appreciate this blog.Really looking forward to read more.